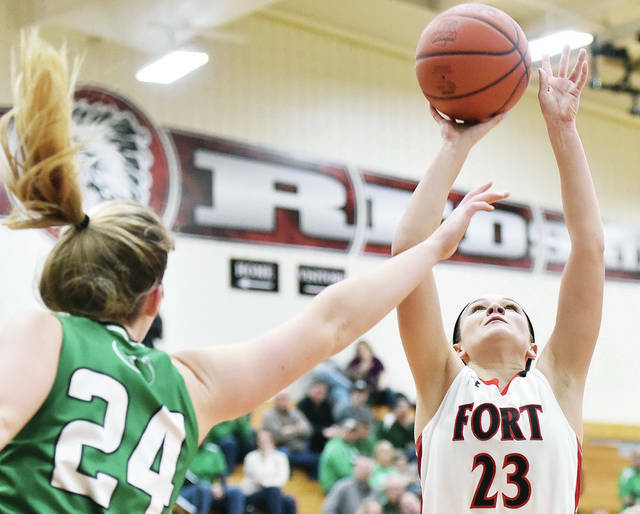 Fort Loramie’s Taylor Ratermann shoots with pressure from Anna’s Kiplyn Rowland during a Shelby County Athletic League game on Saturday in Fort Loramie. The Redskins are No. 1 in Division IV again this week. Fort Loramie and Minster are Nos. 1 and 2 again in this week’s Associated Press state girls basketball Division IV poll. The Redskins (19-1) and Wildcats (17-1) have been in the top two spots all season. Versailles dropped out of the top 10 in Division III this week following a loss to West Liberty-Salem last week. West Liberty-Salem is in the poll for the first time this year at No. 10. Versailles received votes in D-III, as did Anna. Others receiving 12 or more points: 12. Covington 21. 13. Shadyside 16.